July hosted a milestone event for the Errl Cup team. 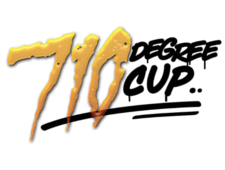 Thanks to our Top Sponsor, Vapen Clear, the 2nd annual 710 Degree Cup Arizona went off without a hitch. It also went off with about 2500 more patients than expected. This proved to be a challenge for us but went over very well with the exhibitors. Over 120 tables were laid out at the Errl 710 Cup, some filled with various types of cannabis to sample, all for FREE. The Gold Sponsors, High Grade, Kind Pen, Swell Farmacy, Yavapai, and Rosin Tech Products were great providers of fun, gifts and education for all the patients that came to the event. All these free products brought MMJ patients from legal states out in droves. The line to get in at one point wrapped a quarter mile down the road into residential homes. Patients waited hours in the hot sun to get into the only Cannabis Festival in Arizona and it proved worth it. Thousands of free samples were given out in the forms of medication and ancillary products. As you enter the 25,000 sqft smoke box, you start to get a nice buzz. By the time you’ve finished with the medicated cotton candy, drinks, brownies, infused snacks, candies and chocolates, you were medicated enough for the week. That did not include the FREE bowls and dabs that almost every exhibitor had, each a different flavor of for you to try. It was a smorgasbord of cannabis and cannabis products, if you could think of it, it was there. If you never thought of it, it was there. There was never a dull moment as you passed from isle to isle, someone made sure to yell out and offer you to come over and get something for free. Speaking of free one of the main exhibits, Errl Wars, was another free event activity presented by the Errl Cup Team. 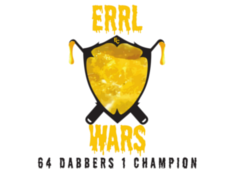 Errl Wars pins selected contenders against each other in a time based dabbing competition. 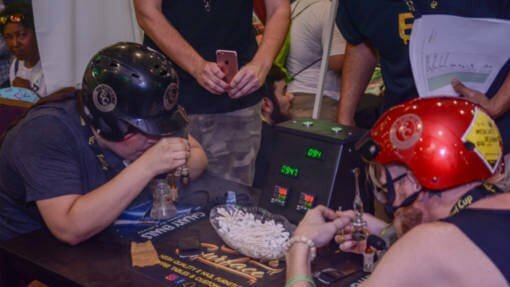 Arizona Organix ,the Errl Wars Sponsor, gave away a total of 59 grams of concentrates to consume during the competition. Contenders started with .10 gram dabs and the final showdown had finalists go head to head on a 1.5 gram dab each. 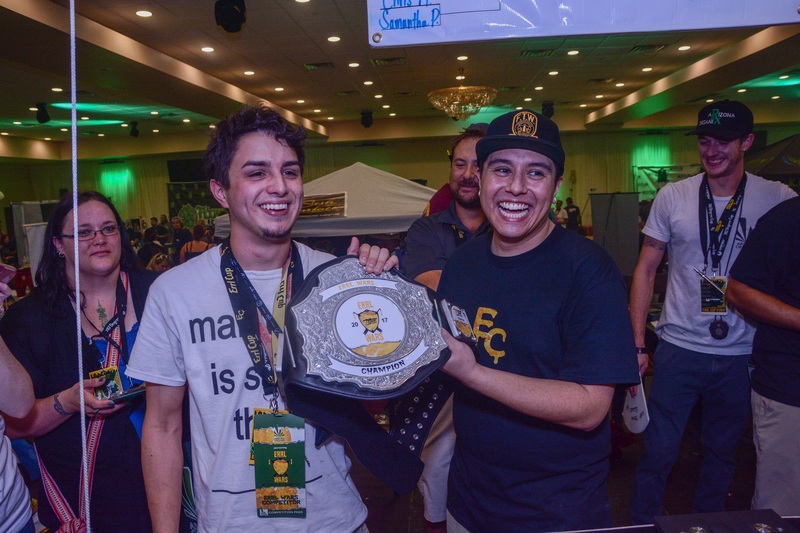 A winner emerged with a custom gold, heavyweight champion type belt as the first victor of Errl Wars. With a time of :42 seconds for his final 1.5 gram dab. Immediately adjacent to the Errl Wars stage was the Errl Cup and C4 Labs booths. 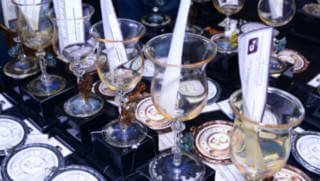 Which exhibited all the lab’s testing results as well as fancily displayed in glass cases all 369 cannabis entries in the 710 Degree Cup. Also on display was 22 hand blown glass awards made by Hensley Glass. Each award had little nugs, slabs and other charms on them to identify the winner. Laid out was also 2nd and 3rd place medals exhibiting the Errl Cup logo. In addition to the awards, winners got FREE lab testing from C4 Labs, FREE Rosin Presses from Rosin Tech Products and FREE CBD seeds from our personal stash! The kick back tunes brought a side to side vibe to the event hall. Not once did I see anyone upset with one another. In fact I was told “I’m Sorry, Excuse Me” more times in 8 hours than ever in my entire life. Cannabis folk really are the kindest people you can party with. Not too far off from the hall in the same building was another 3,000 sqft room designed just for the VIP’s. The adjacent room was fancily decorated with Nature’s Medicine free swag, tables, rigs and too much to mention. The room housed full food and drink, giveaways, a live music stage, lounging couches and a long booth full of one-off glass piece to smoke out of. When Clint Stevens was not playing live in the VIP, the speakers flowed with local hot tracks. The handmade HerbInBaker treats drove VIPS back into the room again and again for the new selection of sweet goodies being brought out. Then the fancy chicken and vegetables meal with salad topped off the evening. 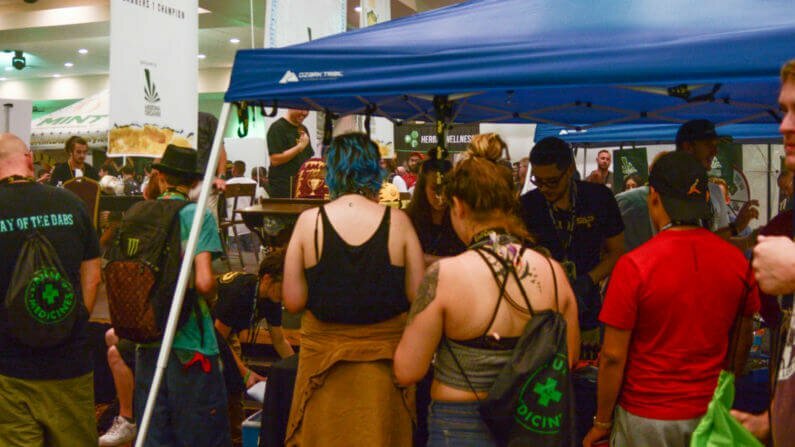 We would like to thank all of our Sponsors, Vendors, Patients, and Volunteers for making this event another success for the Arizona Cannabis Community. 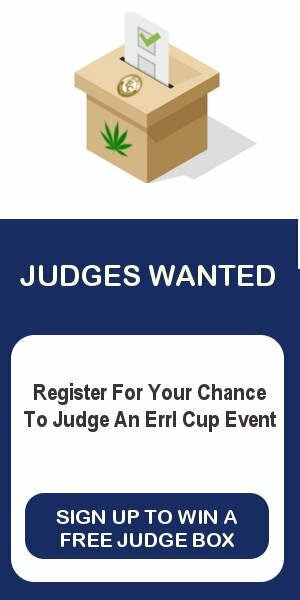 Errl Cup will return to Arizona in January of 2018, in the meantime you can catch all the action in their First Errl Cup Nevada on October 7th at Craig Ranch Park in North Las Vegas, Nevada. This is a massive 7 acre venue. Craig Ranch Regional Park Amphitheater with more space and a 600 seat amphitheater. A live battle of the bands with a cash prize is set for the main stage and over 100 exhibitors, food and dispensaries will be present showing off their brands. We plan to continue our secret shopper series starting with flower in Nevada. In Nevada pricing is still FREE for MMJ cardholders. $20 pre-sale for adults 21+. $35.00 on the day of the event. See you at the next Errl Cup.